Combine the ancient practice of hatha yoga with the shapes and mystical meanings of the Hebrew letters to enhance your physical health and deepen your spiritual life. Can yoga be Jewish? Yes! By blending traditional hatha yoga postures and the forms of the Hebrew aleph-bet, yoga teacher Steven Rapp shows how you can use this ancient health practice to deepen your Jewish spirituality. - Integrate the meaning of each Hebrew letter with the common name of the corresponding hatha yoga pose. - Connect all twenty-seven Hebrew letters with hatha yoga poses that correspond to the shapes of the letters. -Weave together the meaning of each Hebrew letter with the Sanskrit word for the yoga pose and a biblical phrase in meditation. As we move our bodies through the Hebrew aleph-bet, turning toward the inner meaning of the letters, we can tap into the deep connections between our body, mind, and spirit. Drawing on the sacred texts and mystical writings of Judaism, combined with the insights of yoga teacher Steven Rapp, Aleph-Bet Yoga is an East-meets-West experience for our whole selves. Aleph-Bet Yoga makes it easy for anyone to incorporate yoga into their life, and combine the physical and spiritual aspects of Judaism. 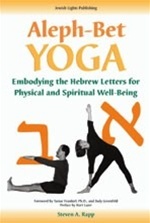 It features step-by-step instructions, photographs clearly demonstrating each yoga pose, and insightful words to inspire and guide us in connecting the spiritual meaning of the Hebrew letters to our yoga practice.